We are pioneer eot crane manufacturer based in Ahmedabad which is industrial hub of state of Gujarat. 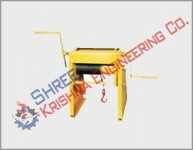 We manufacture the variety of eot crane depending upon the lifting of load carrying capacities. 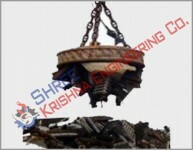 Our design and manufactured eot crane have been successfully operational in variety of industries. 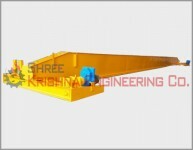 Single girderEot crane - The crane consists of a single bridge girder supported on two end trucks. 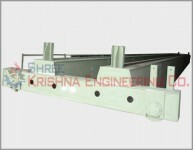 It has a trolley hoist mechanism that runs on the bottom flange of the bridge girder. Double Girder eot Crane – This type of EOT crane consists of two bridge girders supported on two end trucks. The trolley runs on rails on the top of the bridge girders. Gantry Cranes - These cranes are essentially the same as the regular overhead cranes except that the bridge for carrying the trolley or trolleys is rigidly supported on two or more legs running on fixed rails or other runway. These “legs” eliminate the supporting runway and column system and connect to end trucks which run on a rail either embedded in, or laid on top of, the floor. Monorail - For some applications such as production assembly line or service line, only a trolley hoist is required. The hoisting mechanism is similar to a single girder crane with a difference that the crane doesn’t have a movable bridge and the hoisting trolley runs on a fixed girder. Monorail beams are usually I-beams (tapered beam flanges). 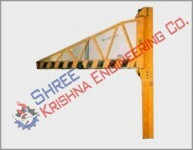 Crane Capacity - The rated load, the crane will be required to lift. Rated load shall mean the maximum load for which a crane or individual hoist is designed and built by the manufacturer and shown on the equipment identification plate. Lift Height - The rated lift means the distance between the upper and lower elevations of travel of the load block and arithmetically it is usually the distance between the beam and the floor, minus the height of the hoist. This dimension is critical in most applications as it determines the height of the runway from the floor and is dependent on the clear inside height of the building. Do not forget to include any slings or below the hook devices that would influence this value. Runway Height – The distance between the grade level and the top of the rail. 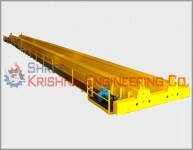 Clearance- The vertical distance between the grade level and the bottom of the crane girder. Clear Span- Distance between columns across the width of the building. Building width is defined as the distance from outside of eave strut of one sidewall to outside of eave strut of the opposite sidewall. Crane Span is the horizontal center distance between the rails of the runway on which the crane is to travel. Typically distance is approximate to 500mm less than the width of the building. How much span a crane requires depends on the crane coverage width dictated by the application. (According to the span and the maximum load handling capacity, the crane steel structure is selected to be either a single or double girder crane construction). Building Height- Building height is the eave height which usually is the distance from the bottom of the main frame column base plate to the top outer point of the eave strut. Eave height is the distance from the finished floor to the top outer point of the eave strut. There must be a safety distance between the top edge of the crane runway rail and the first obstacle edge in the building (for example roof beams, lights and pipes). Runway Length- The longitudinal run of the runway rail parallel to the length of the building. Hook approaches - Maximum hook approach is the distance from the wall to the nearest possible position of the hook. The smaller the distance is, the better can the floor area be utilized. Always check which crane gives optimum hook approaches and when combined with the true lift of the hoist you can utilize most of the available floor space. This is also termed as side hook approach. End Approach – This term describes the minimum horizontal distance, parallel to the runway, between the outermost extremities of the crane and the centerline of the hook. Bridge, Trolley and Lift Speeds - The rate at which the bridge or trolley travels or at which the hoist lifts is usually specified in feet per minute or FPM. The crane operating speeds are selected to allow safe operation whilst using the pendant. Dual operating speeds, normally a fast and slow speed with a ratio of 4:1 are commonly used but for optimum control a variable speed control system is strongly recommended. Control Requirements - The control circuit voltage at pendant pushbuttons shall not exceed 150 volts for AC and 300 volts for DC. Other control options including radio control, free-floating pendant (festooned) or hoist-mounted pendant requirements must be stated. Other than addressing the above parameters, some specific conditions applicable to your application must be mentioned. Do you need the use of a second hoist on the bridge crane? 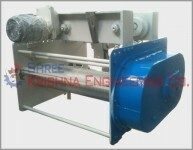 (This hoist may be used as an auxiliary hoist or be required in a process such as tilting/tipping. In case you are handling long materials, like steel tubes and plates, the best solution are to have a crane with two hoists (and hooks) for better stability of the load ensuring safe lifting). What will the operating environment be (dust, paint fumes, outdoor, etc.)? Is there existing cranes on the runway? Then, consider the use of a collision avoidance or collision warning system. Copyright © 2019. 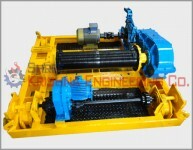 All rights reserved at Shree Krishna Engineering Co.